In a world of information overload, it can be very difficult to stand out. Yet, if you are willing to incorporate video as part of your marketing strategy, you have an opportunity to humanize your brand as a real estate professional and build an audience that is already interested in what you have to offer. So, what kind of content should you be creating? And what tools are available to help you produce high-quality videos? 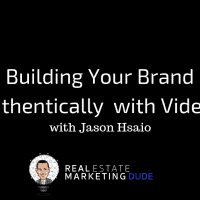 Jason Hsaio is the cofounder and Chief Video Officer at Animoto, an award-winning online platform that allows anyone to drag and drop their way to powerful and professional marketing videos. More than one million businesses around the world have leveraged Anitmoto to stand out on social media and grow their customer base. Prior to founding Animoto in 2006, Jason spent six years as television producer at MTV and Comedy Central. Today, Jason joins me to explain how video keeps your existing audience engaged AND helps you grow your audience efficiently. He explains how to leverage targeting and retargeting, making the most of your marketing dollars by getting in front of the right people on social media. Jason also offers insight around the best length for video, the importance of authenticity and the growing popularity of video as the way people consume information. Listen in to understand how a real estate agent might use Anitmoto’s drag-and-drop tool and learn how to leverage video to amplify what already works for you! Find out what Animoto has to offer and learn more about Jason by visiting animoto.com/realestatemarketingdude.